Stone Pillar with Flickering Torch « Adafruit Industries – Makers, hackers, artists, designers and engineers! RobagoN shared this project on Thingiverse ! 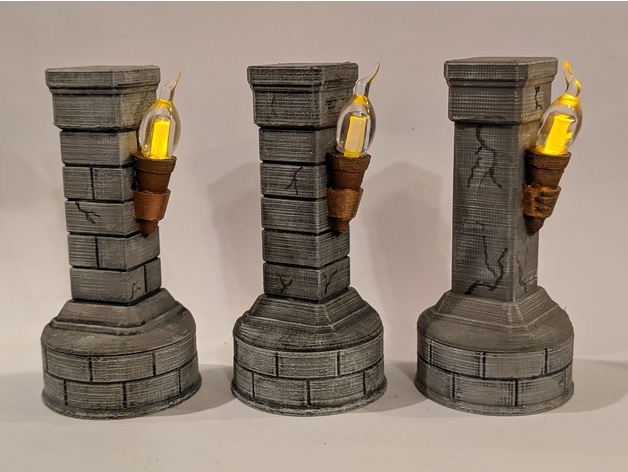 Cheer up the gloom with some stone pillars/columns with real flickering torches for all your dungeon adventures. No soldering necessary! The base of a flickering orange tealight and a section of acrylic rod, acting as a light pipe, are used to bring the torches to life. The plastic flame cap for the tea light is also used for the torch flame.